Barrier-free, accessible, universal, and inclusive design are all terms used to describe the same thing: a design that creates a built environment usable by everyone. Minimum barrier-free design requirements are derived from the provincial and national building codes. Meanwhile, provinces and municipalities across Canada are going above and beyond the minimum to develop and enforce their own, more restrictive barrier-free requirements in an effort to achieve overall equality amongst their communities in areas related to customer service, information and communication, transportation, employment, and the built environment. Similar to the United States and its Americans with Disabilities Act (ADA), Canada is developing a legislation that will potentially enforce a uniform level of accessibility across the nation. Until then, the most nationally recognized and recommended accessible design guide is CAN/CSA B651, Accessible Design for the Built Environment. Typically, compliance with accessibility standards and guidelines is required for public buildings (government-owned/funded projects), while private buildings must typically comply with the minimum requirements of the project-specific building code and, where enforced, provincial accessibility legislation (e.g. the Accessibility for Ontarians with Disabilities Act [AODA]). The reality of designing a project to the minimum code requirements is that not every project is required to be barrier-free—buildings exempt from this requirement could include existing or smaller buildings. This article guides readers through minimum barrier-free requirements prescribed by various provincial building codes and the National Building Code of Canada (NBC), followed by best-practice recommendations compiled from various accessibility standards and guidelines, as well as experiences over the years. (These include the 2012 Ontario Building Code [OBC], 2012 B.C. Building Code, Manitoba’s Buildings and Mobile Homes Act, and the 2014 Alberta Building Code [ABC]. 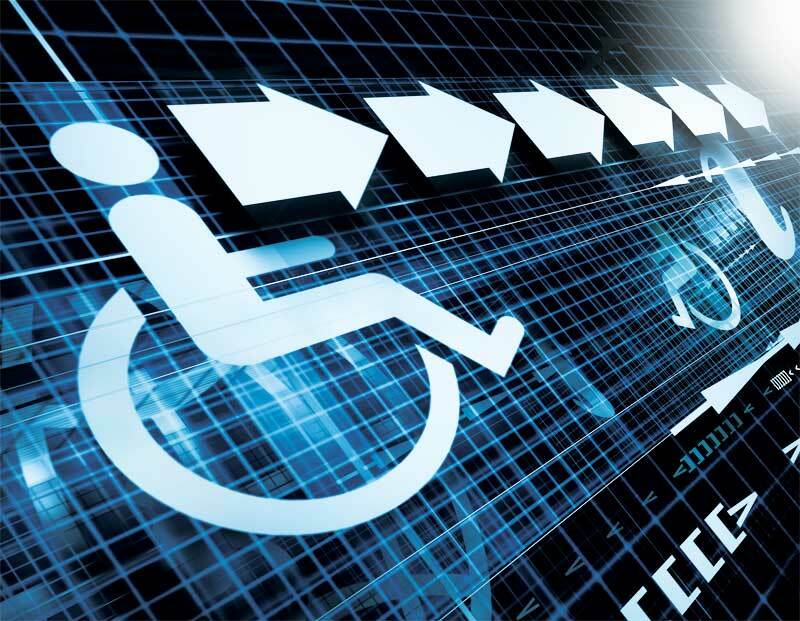 Some accessibility design standards used for best-practice principles for this article include CAN/CSA B651-12, Accessible Design for the Built Environment, the Accessibility for Ontarians with Disabilities Act [AODA], and Calgary’s Access Design Standards.) All requirements have been generalized—throughout this article, the term ‘code’ is broadly used to describe building codes, and is not intended to focus on one provincial code over another unless otherwise specified. Barrier-free design should always start from the outside and work its way in: exterior, interior, washrooms. An exterior barrier-free path of travel must connect accessible parking spaces (above-and below-grade) and passenger loading zones to a required barrier-free entrance. For best practice, the path of travel should also connect transit stops for commuters and a relieving area for service dogs (located near a barrier-free entrance). All buildings subject to compliance with Section 3.8 of NBC, “Barrier-free Design,” must be provided with a minimum number of barrier-free entrances. Depending on the province, at least one of these may need to be the principal entrance (Figure 1). The best-practice recommendation is any entrance that can be used by occupants (i.e. staff and/or pedestrians) should be barrier-free and equipped with a power door operator. Figure 1: Provincial building codes in Ontario, Manitoba, and Alberta have slightly different requirements for the barrier-free entrance.